Hi everyone, welcome to the Eastern Front Mid War Live Launch. The team is gathered together and ready to spend the next two days eating, sleeping and thinking Mid War! Maybe that is a little of an overstatement but we are all pretty excited about what you will find in these two great books, Iron Cross and Enemy at the Gates. Over the next two days we will be sharing our thoughts, our armies, and anything else that comes to mind. 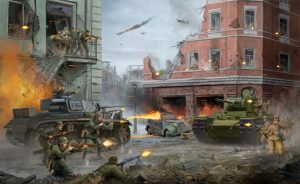 To go with the release of Enemy at the Gates and Iron Cross we will be having another Live Launch Event on the Flames Of War website. Enemy at the Gates and Iron Cross both look at the hard-fought battles that took place in 1942 and early 1943 across the Eastern Front. Whilst our Live Launch will be taking place on the 23rd and the 24th Of August so make sure you tune in across the two days to keep track of all the activities and information. and finally, we will be answering your questions about the two new books! To answer your questions, you need to know what they are! Send your questions about these two books or Mid War in general through to us at [email protected]. We’ll go through as many as we can and pick out the best ones. If you’ve never seen one of our Live Launches before you can check out the link below to get an idea of what to expect and to see a full list of all of our previous events.